Liberty Bell Mountain and Early Winter Spires at Blue Lake in the North Cascades of the Okanogan-Wenatchee National Forest in Washington State, USA. A few years ago I hiked up to Blue Lake in the Washington Pass area of the Okanogan-Wenatchee National Forest – an area I had always thought of as part of North Cascades National Park. While Washington Pass is very close to the National Park, and some of area is in part maintained by the National Parks Service (especially the Washington Pass Overlook), it is part of the National Forest not the National Park. The parking lot and trail head can be found along Highway 20 (North Cascades Highway) 1.26km/4128 feet west of the Washington Pass Overlook turnoff. The short hike to Blue Lake is only 3.2km/2 mile and gains 350m/1050 feet of elevation to a total of 1906m/6254 feet. This photo is made a few hundred feet higher than that, along (and up) a trail to the west of the lake. As you can see from the above photograph, Blue Lake is aptly named. I was fortunate on this trip to arrive when the Subalpine Larch (Larix lyallii) were turning colour. Subalpine and other species of Larch are one of the few conifer species that are deciduous – they lose their needles each fall. This can be a beautiful display but is only found in higher elevations in this part of the world. Blue Lake is situated immediately below the iconic Liberty Bell Mountain. Liberty Bell is the spire on the left hand side of this photograph next to Concord Tower, Lexington Tower, and the Early Either Spires (North and South). Another view of Liberty Bell can be seen in my older post with some photographs from Washington Pass. 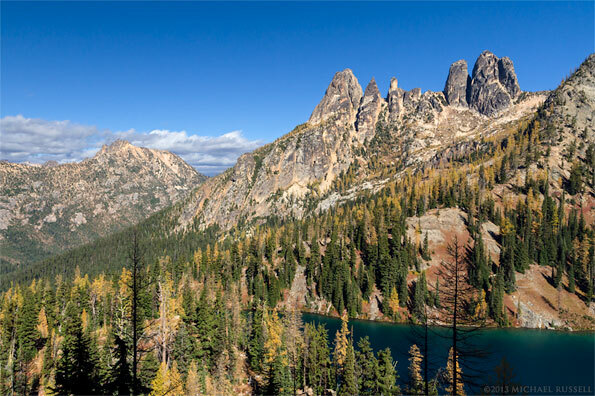 For more photographs from the Washington Pass area of the North Cascades visit my Okanogan-Wenatchee National Forest Gallery in the Image Library.